Where to start? As I have stated previously I plan on making a lot of bread this year. The year starting with the cooler weather setting in. 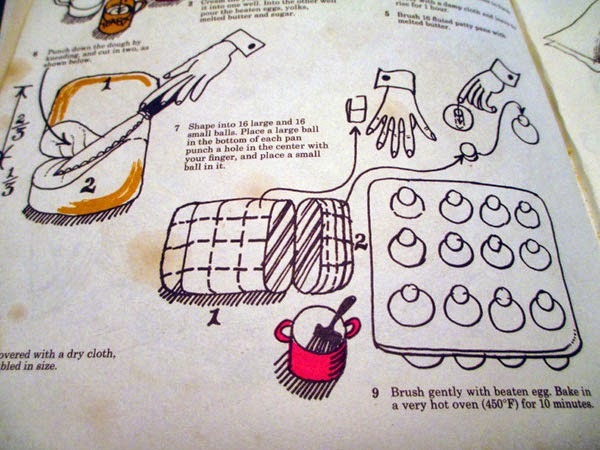 I have a cookbook which I have had forever, A Basket of Homemade Breads. I decided on the Brioche. The recipe makes 16 rolls. Seeing as it is just the two of us I cut the recipe in half. The dough has a fantastic texture. See the bottom of this post for the recipe. Today I made the first large pot of my Mom's Meat Sauce. I needed some bread to go with the sauce. 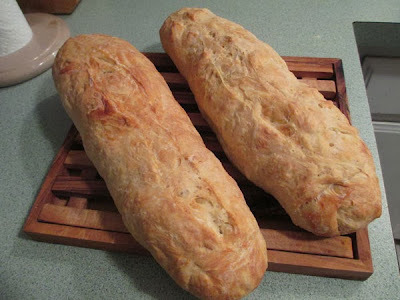 I remembered a recipe I found last year, No Knead French Bread. 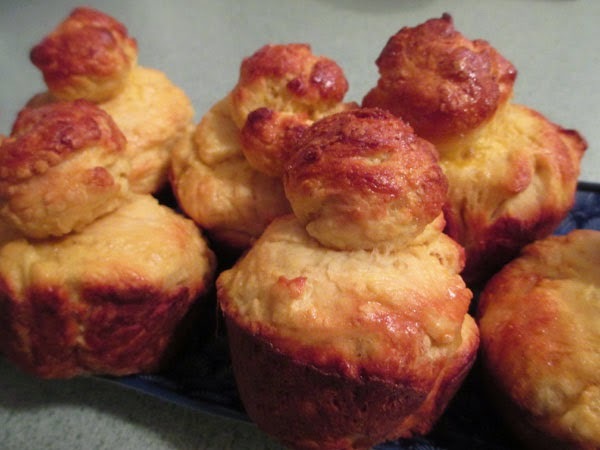 The big advantage of this recipe is that it does not take 18 hours for the dough to rise. I LOVE this recipe! 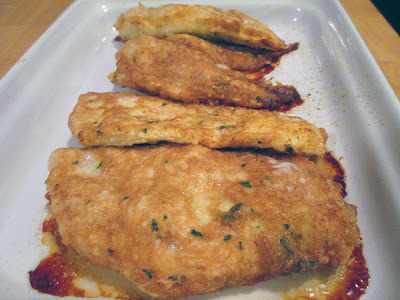 Click Here to view the recipe and visit the blog Noshtalgia. 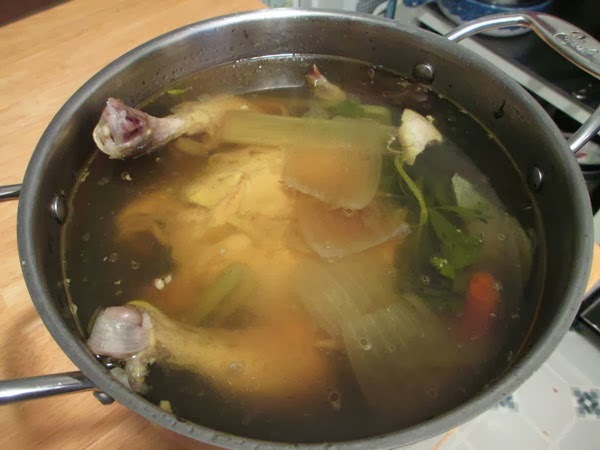 Next we have the Chicken Soup. I used my sister Lenore's recipe. 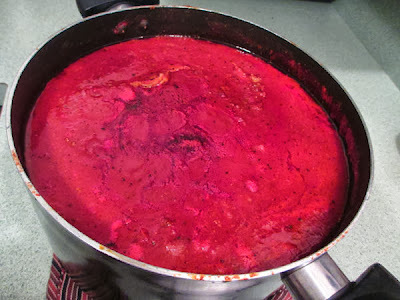 It simmered for over 3 hours and the cats were beside themselves when I was removing the meat from the carcass! Click Here for the recipe. Seeing I had the soup simmering on the stove it seemed like the perfect time to make our first pot of meat sauce. I sauteed chopped onions and browned the sausages and ground meat. I added the crushed tomatoes and let that simmer. My sister recently reminded me that our Mom use to add chicken legs to her sauce. I opted for adding boneless chicken thighs. I let that simmer for about 3 hours, seasoning it with salt, pepper, oregano, basil and parsley. After it cooled it went into the fridge so tomorrow I will remove any fat from the top of the pot. And now what did we have for dinner? I decided on making my Mom's Chicken Cutlets when I was mixing the Brioche dough this morning. I ended up with 2 egg whites and a yolk (I only used an egg white for the glaze on the Brioche). Mom's recipe for Chicken Cutlets requires the egg whites to be beaten separately before adding the yolks so it seemed like a perfect way use up the eggs. The meat was so moist and the breading was the perfect color. Click Here for the recipe. 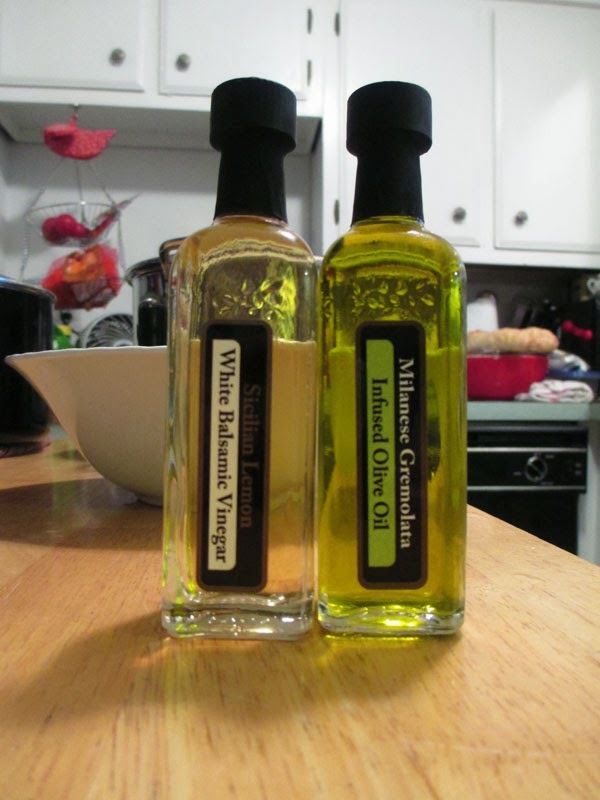 We have a new olive oil store in town, The Shoreline Vine. What an amazing place. You can taste every oil and vinegar... which made for an interesting lunch. 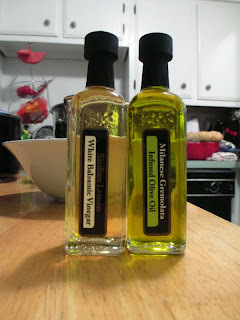 I picked up these 2 small bottles and it seemed perfect for our side dish. I think I may have picked the last of the green beans today. And we had a couple of small tomatoes. Those along with some tomatoes I from my brother-in-law, Ralph, were mixed together for one last tomato and green bean salad. 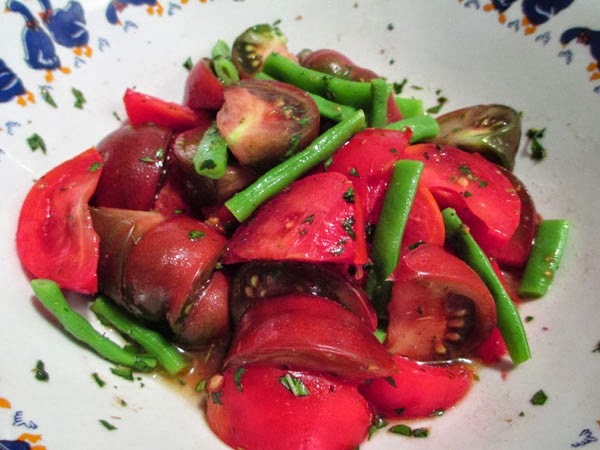 Actually I think this may have been our only tomato and green bean salad of the summer! I steamed the beans and seasoned them along with the tomatoes with the vinegar and olive oil pictured above and salt, pepper, oregano, basil and parsley. Excellent. 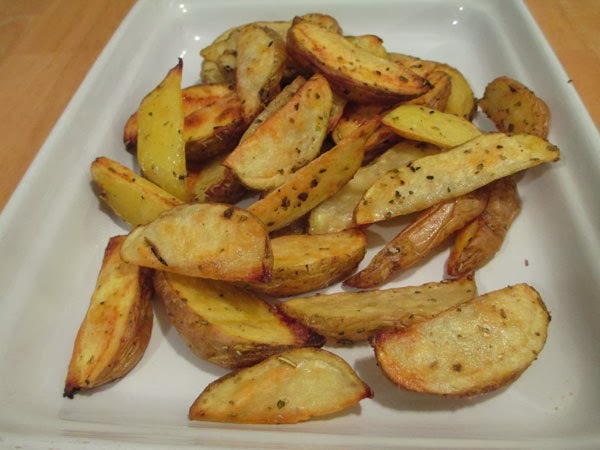 And of course there was also my favorite - Roasted Potatoes! Brioche, from A Basket of Homemade Breads. 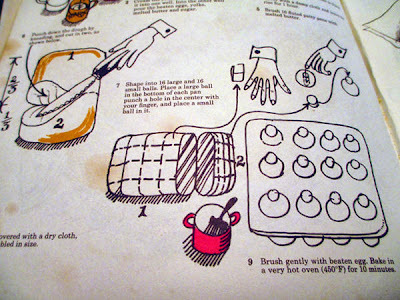 This recipe as shown here will result in 16 rolls. 1. Sift the flour and salt into a bowl. Make two wells in it. 2. Cream the yeast with the water and pour it into one well. Into the other well pour the beaten eggs, yolks, melted butter and sugar. 3. Beat together with your hands to form a fairly soft dough. 4. Cover with a damp cloth and leave to rise for 1 hour. 5. Brush 16 cupcake cups with melted butter. 8. Prove, covered with a dry cloth, until doubled in size. 9. Brush gently with beaten egg, you don't want to knock off the small ball of dough. Bake in a very hot oven (450ºF) for 10 minutes. My copy of this book has been used a lot as this photo will show! Labels: Bread, Brioche, Chicken broth, Italian Bread, Meat Sauce, Mom's Chicken Cutlet Recipe, Noshtalgia, The Shoreline Vine.